What would you expect these signs to be advertising? Fruits? Clothes? Electronics? For today, we are Jason and Jenny Tan, helping our parents to enquire about the procedures needed to hire a foreign domestic worker, or, to use local parlance, to “get a maid”. As we navigate through Katong Shopping Centre, where more than thirty helper agencies are clustered, it is immediately clear that something about the way helpers are viewed in our society is not quite right. The names of many agencies provide the first hint: one is called Value Employment Agency, another, Better helper Employment Agency. Several even go so far as to eschew “Employment Agency” altogether, with one calling itself “Crislo Resources”, as though helpers were expendable assets. And perhaps the most appalling one we found: “Superservants”. Meanwhile, shopfronts are adorned with gaudy sign boards and banners that clamour for our attention, boasting of irresistible package deals and unbeatable markdowns. Some agencies even showcase helpers repeatedly performing household duties such as ironing clothes or rocking a doll to sleep under the guise of “in-house training”. And so, as we watch rows of helpers sitting silently across reception counters, it becomes hard to ignore the lingering feeling that these women have been reduced to products, put on a display for us to appraise. As our journey to find a suitable helper progresses, it becomes clearer that, just as products are branded with unique selling points, so too are helpers labelled with distinctive characteristics for promotion. Burmese helpers are “better with the elderly”, “more patient”, and “more hardworking”. 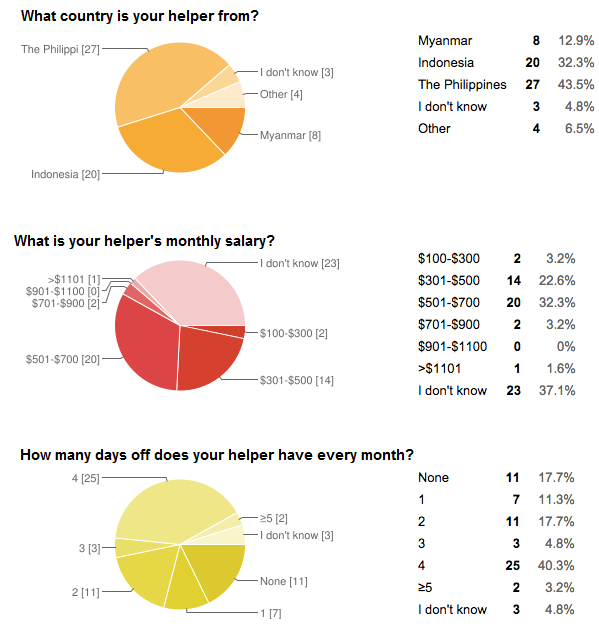 Indonesian helpers are “better with infants”, and helpers from the Philippines are “generally more skilled” and more educated. The indifference with which terms usually used to describe commodities are applied to helpers are extremely disconcerting. The whole notion of “hiring” or “a service” gets intentionally replaced with a purchase of a good, where each good suits a different family. On a related note, agencies also earnestly assure us that if we are unhappy with our helper in any way, we are free to exchange her for another one under the many packages that advertise one replacement within six months or unlimited replacements within a year. Despite the Ministry of Manpower having issued a statement asserting the unacceptability of such practices and urging agencies to ensure helpers were accorded “basic respect and human dignity”, we see no change since the statement’s passing as we begin to face difficulties in separating the idea of a “good” from the helper. Domestic Workers “displaying” their household competencies to potential owners. We’re disgusted by this, but why aren’t Singaporeans reacting the same way? To witness actual businesses marketing the providers of a service as a product is extremely discomforting, especially since these very “products” for sale are present as we speak to the sales representatives. This is where the dehumanization process begins. Agencies consciously decide to market actual human beings as mere products – stripped of the very essence of their being and reduced to items on a counter waiting for potential purchase. Upon entry into the home, the ideal story would chart the helper’s blissful, and largely undisturbed working journey. However, reality is far harsher than this idealistic scenario. Firstly, helpers often owe a $3000-$4000 debt to the agency that arises from the agency’s role in both scouting for and training the helper. This means that, for seven to eight months, all of their monthly salary – except a measly $20, which is still dependent on the employer’s willingness to give the helper more – goes towards repaying this debt. The helper only stands to gain more when she sacrifices her 4 compulsory days off to continue working, which thereby helps her gain $20 per day that she could potentially keep as allowance or use to repay this very debt. This financial burden seems easy to manage when we imagine her salary to be around the $500-$700 range, but this figure is only received by helpers of Filipino descent, or helpers with a hearty amount of experience in the field. 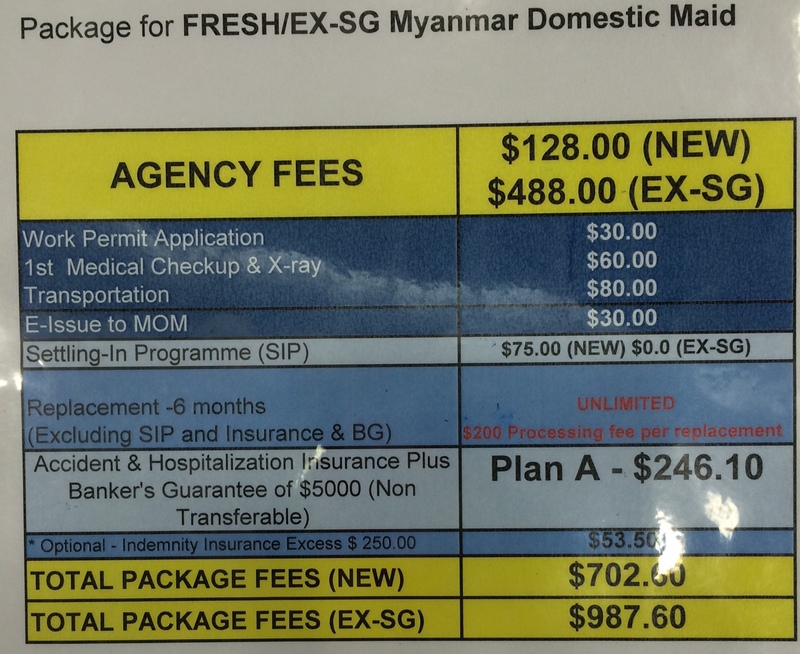 helpers new to the field only receive a starting pay between $400-$500, with some Burmese helpers being underpaid at a range of $350-$450 when the Myanmar Government had specified that their domestic workers ought to receive a minimum wage of $450. At this juncture, we’re reminded of the fact that the main reason to why these foreign domestic workers have chosen to work in Singapore is arguably the monetary incentive. Having sacrificed their life back in their home country to help support their family, it seems poignantly ironic that they are effectively forced to hemorrhage the money they would be earning in their first seven to eight months. This problem is further worsened when helpers are transferred midway through the payment of their debt, whereby their debt may potentially get reset through the agency and then repaid through the new family. With this financial burden, we’d like to draw the crude comparison of the helper’s job to the concept of a slave by looking at another dimension: the work environment. There is a disturbing number of netizens that support setting strict rules within the household for the helper to abide by. These rules not only serve to monitor the helper’s behaviour, they also significantly restrict the helper’s social expression and freedom by large amounts for the sake of professionalism. Having decided on the nationality of our helper, we proceed to skim through stacks of thin bio-data folders. Each folder contains a set of short, objective descriptors redolent of a list of product specifications, including name, height, weight, and skills. It is discomfiting to be holding classified information of humans, who, at 25 years of age, have been distilled into three pages of checkboxes enumerating adeptness at cleaning and taking care of the elderly. Strikingly, the signatures – perhaps the one area in which one’s individuality can flourish in folders such as these – are produced by a font. Most of the duties of the helpers employed by Rafflesians coincide with the ones presented on the bio-data sheet: namely cleaning and cooking. Some oddities in the survey, however, showed us that some 5 of the 62 respondents have had their helpers help their family’s children with homework. This journalist feels uncomfortable with the idea that one day the role of a domestic worker and tuition teacher conflates to form a “super helper”. We’re sure that agencies would undoubtedly hop onto the bandwagon to exploit this new “feature” of a helper, providing them equally vigorous academic training as they did with household chores. As such, the line between helper, good, and even slave begins to blur. While in name we identify them as helpers, the skillsets that they serve to earn can only expand as agencies compete with one another. From which helper can fold the sheets the quickest, to a potential future in which helpers now come with “A for PSLE MATH” guarantees, there’s no telling what agencies would do in order to gain a profit. From slashing down recommended salaries to publishing catalogues of women kept in colour-coded binders, it seems as if the term “helper” is simply a façade to keep this trade human. We struggle to grasp the idea that someone could consciously decide to suppress, or even abandon, the very essence of her identity: personality facets, a 20-year history filled with stories at every turn, and the fundamental need to express oneself. In contrast to the arduous journey of work permits, Skype call interviews, and household trainings, this mental hurdle seems to be unreasonably more daunting than the physical commitments to being a helper. In this sense, perhaps it is most apt to see every helper as a resilient, strong, and independent woman. The helper is someone who makes the decision to support her loved ones by leaving the life she knew for a scarily indefinite period of time; someone who toils at repetitive physical labour; someone who embarks into a new stage of her life alone and unsure of what is to come. In failing to realise this, we unknowingly sterilise our view of the helper to a perspective that’s strangely inhuman. Furthermore, do we really know that much about our helpers? From her opinions and personality, down to the life she lived before she left for Singapore: we typically know nothing about our helper beyond her job and many employers do not deign to ask. It seems incredibly daunting to forgo all these aspects that make one human in the interactions with our helper – to us, she seems to be anything but the human we ought to see her as. The real question lies in what stops us from seeing the helper in this light – a light that humanises them from the product that they’ve ultimately been forced to become. Are we lazy? Complacent? Or simply stubborn to the point of rejecting any possible, positive outcome that could come out of actively trying to find out more about our helper? All these possibilities are underpinned by our false expectations of the helper-owner relationship. When anyone decides to spend more than 95% of their working lives with a family, such a relationship shouldn’t be so carelessly deemed to be a purely monetary one. Hiring a helper isn’t an exchange of goods and services – it’s a very human interaction that some of us have failed to properly acknowledge over the years. This exchange is defined by an additional duty to make a helper’s time in Singapore one that is as “human” as possible, while our helpers have a duty to us not only as a helper but also as a new member to the family. To return to a more Rafflesian context, it is relieving to know that our worries can be put to rest. On working hours and days off, the mode of responses show us that helpers of Rafflesians work 11 hours a day, with 4 days off a week. On top of this, more than half of Rafflesians (39 out of 62 responses) have daily conversation with their helpers, and even have their helpers tell them about her life experiences. On average, Rafflesians rank their family’s closeness to their helpers at 4.8 on a scale of 1 to 7, a result which easily qualifies for a B in exam-speak. This is further supported by heartwarming remarks such as “almost like a family member”, and “she is awesome and dependable” that indicate the successful integration of their helpers into the family. While some responses identified certain flaws with regard to the professional relationship with their helper (e.g. “…she herself (would not) talk”), we ought to take the positive majority in our stead. This means to not only converse with our helper, but to affirm her in her actions, actively seek to include her in a suitably warm environment, and to do away with the idea that she is strictly a helper. But most importantly, perhaps we could all – either in secret or not – take a moment to properly admire her struggle, her journey, and most definitely her person. The EmancipAsia series is one that aims to raise awareness of human trafficking in Singapore, and call for reflections on the treatment on foreign workers in our nation. To read more articles from this series: click here. Same sentiments when I went to Katong Shopping Centre too. Perhaps you could consider using the term “domestic workers” instead of “maids”. Yep, locals call them maids whereas expats more politely call them “helpers”.